It's over 15 years since your parents were rendered jobless following the liquidation of Nigeria Airways. Things may have been difficult, and you have been wondering if they will ever get paid their pension and other benefits. Worry no more. Following the announcement of the immediate release of funds by President Buhari in September, the ministry of finance has announced date and venue for a verification exercise that will precede payment. Three venues have been selected for the payment exercise. Those in the north can go to Kano (ABC, former Nigeria Airways office, Bank Road), eastern residents can go to Enugu (Villa Toscana Hotel, No 1 Aguleri street, Independent Layout, Enugu), while those in the South West can go to Lagos (Sky-Power Catering, Ikeja). The date for the exercise is between October 15 and 22, 2018 for Kano and Lagos, while that of Enugu will run between October 15 and 18. 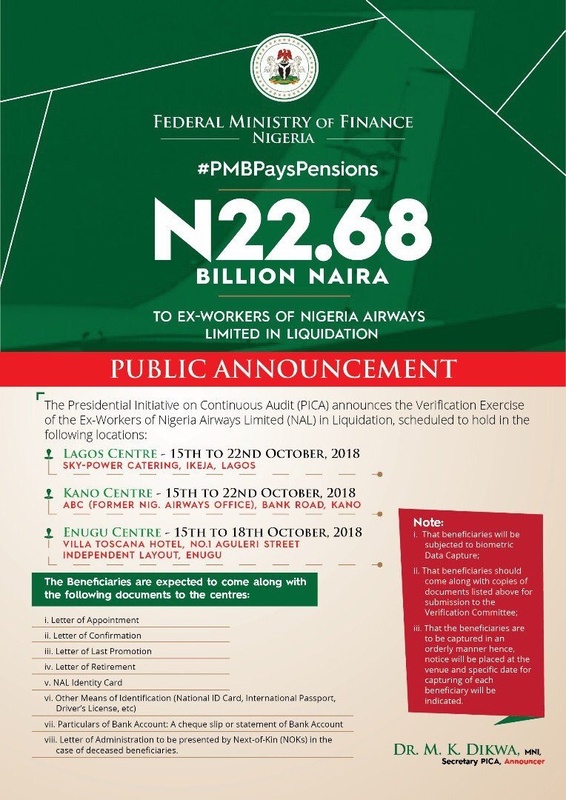 The federal government had in September, released N22.68 billion to settle part of the retirement benefits of former workers of Nigeria Airways. Zainab Ahmed, minister of finance, also said the government had approved the release of N20 billion to revitalise public universities in line with demands of the Academic Staff of Universities (ASUU). “As you are aware, the ex-workers of Nigeria Airways Limited in liquidation were not paid their retirement benefits for the past 15 years despite the liquidation.